Combined deicing sensor and dish heating system for direct control for small to medium satellite antennas; optional available for big satellite antenna dishes. The Hiltron Deicing Control Unit HDCU is a combined deicing sensor and heating system controller built up for outdoor application. It is primarely designed for direct control of small to medium (14 kW) electric satellite antenna de-icing system. 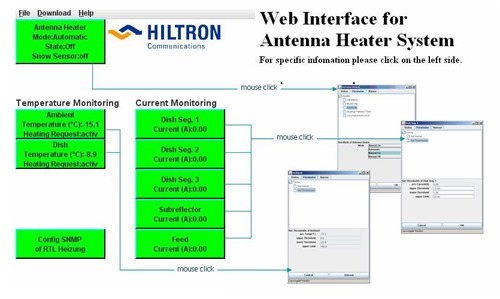 As an option the Hiltron Control Unit is also available for big antenna dishes. The Control Unit provides three plus one individual circuits for load control. 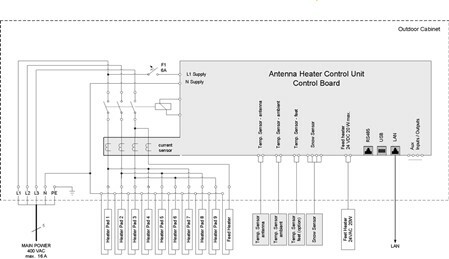 Each of the three heater circuits (see figure) can supply up to three antenna heater pads. Thus in total 9 heater pads can be connected. The permitted current for the three heater circuits is max. 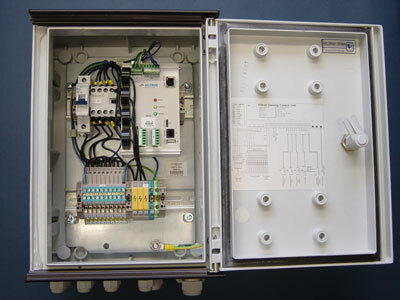 20 A per circuit and can be controlled and monitored independently via LAN or a remote serial interface (option). For the supply of a feed/sub-reflector heating with 24V a further independent monitoring and control circuit is implemented. The max. permitted power capability is 20VA. In case of a 230V supply for feed/sub-reflector is required a further heater circuit is available which is monitored and controlled separately. The Hiltron Antenna Deicing Control Unit requires a 85-260 VAC 50/60 Hz source. The contacts are rated up to 20A @ 240 VAC. The standard (recommended) application is the 3-phase operation with mains power 400 VAC. The max. current per phase is rated to 20 A. The Hiltron Antenna Deicing Control Unit can be operated manual control mode as well. In manual operation mode the heater function can be switches on or off. The detected currents and temperatures, however, are monitored and available via Web-interface, SNMP or on RS485 interface on a mounted hand terminal. Optional are provided logical control inputs and monitoring outputs (dry relay contact) to control the antenna de-icing remotely straight forward. A RS485 interface (connector RJ45) for remote control via a remote hand terminal. Size: 250 x 350 x 160 mm³. Heater current control and protection. Max. supply current per segment (phase) 20 A.